"People are just starting, I think, to understand the true bounty of the Bakken and how long it's going to be there and how good it's going to be there." 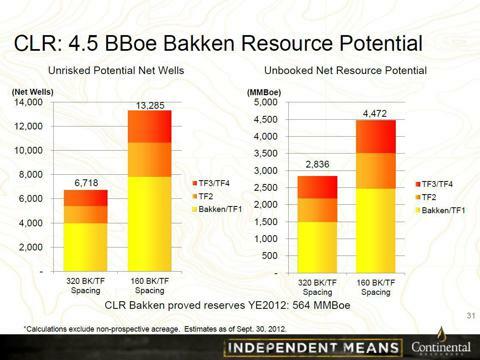 The Bakken is gearing up for a radical downspacing. High density testing will kick off this year with several large-scale pilots being simultaneously initiated across the play. Several operators - including Continental Resources (NYSE:CLR), Whiting Petroleum, EOG Resources (NYSE:EOG), Kodiak Oil & Gas (NYSE:KOG) and Oasis Petroleum (NYSE:OAS) - have announced extensive evaluation programs. Others are likely moving ahead in the same direction, without special announcement. Many of the pilots are comprehensive, geoscience-heavy and are based on very aggressive downspacing patterns. Several projects will test "vertical downspacing," with wells arrayed throughout a wide section of the Bakken/Three Forks (TF) interval, including the lower TF benches. Large amounts of capital are being committed to the effort: Continental plans to drill 47 wells in its program; Kodiak will be spending one third of its total budget this year on high density pilots; and Whiting is initiating six or seven multi-well projects. Importantly, the downspacing in the Bakken may give broad acceptance to a new approach - which is showing signs of emerging - to managing fracture stimulation programs in thick shales. "Array Fracking" may be a good moniker to describe the concept of creating an integrated fracture systems in a thick, high oil content reservoir from multiple optimally positioned wellbores (similar approach seems to be gaining traction in the Niobrara). The picture below from Continental's presentation provides the idea of how aggressive some of the downspacing pilots can get. 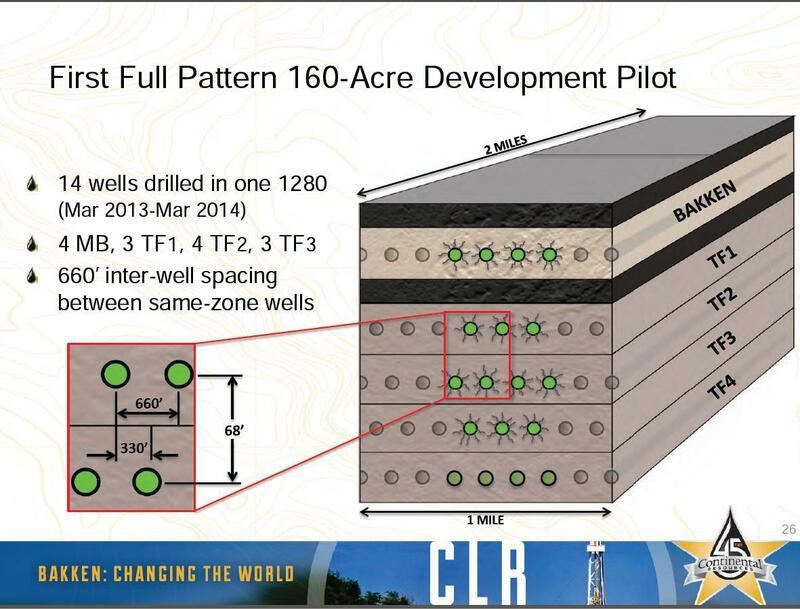 In this specific case, "high density drilling" means up to 32 wells per single drilling unit in full development mode with laterals landed in four stacked intervals (possibly five if TF4 proved productive), a truly staggering density relative to the 7-8 well patterns that have been considered "dense" until recently. The results of the evaluations, if positive, may become an important catalyst for the Bakken as a whole and could lead to yet another leap in the estimate for the play's recoverable reserves and economic value. Several highly reputed operators claim that they see minimal on-production communication between wellbores with short offset intervals (this is, for example, Continental's view based on their evaluation on over a hundred well pairs' performance, the view also shared by Kodiak). The feasibility of downspacing with dense arrays of wellbores is still an uncharted territory. It very much remains to be proven - for each specific area and set of geological intervals - that a meaningful downspacing can be achieved without big sacrifice in the EUR per well. The search process may also bring substantial modifications to the way wells are currently being completed and produced. 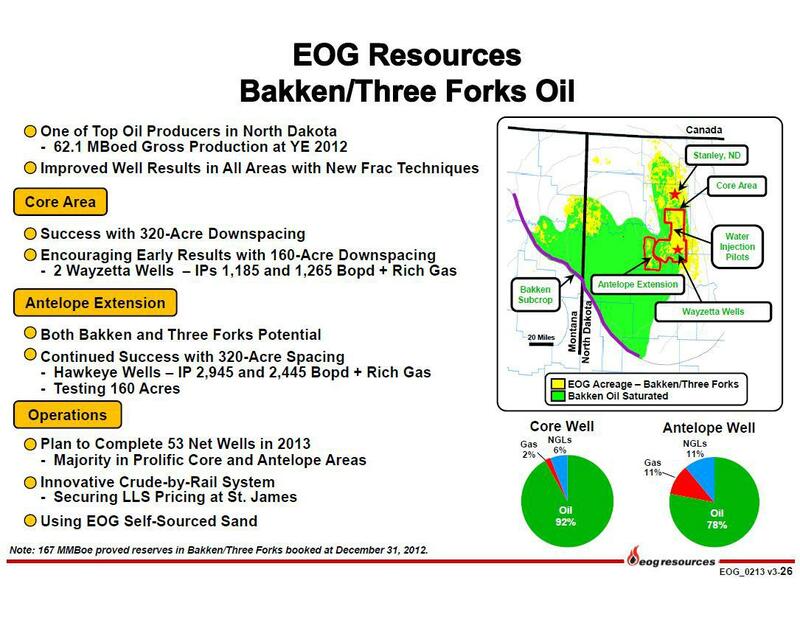 If proven successful, the approach may mean quite a revolution for the Bakken development. What that really is all about is the recognition that when you go through - and do the oil in place calculations - through most of the properties and look at most of the operators in the basin, including ourselves, at the current density that we're drilling, we're getting about 10%, maybe as much as 11% or 12% recovery, of the oil in place. The question has always been -we've drilled at these wells based on essentially no interference - the question in our minds here over the last several months and last year or so, and not just ourselves but other operators, is: What happens? How do we increase that recovery efficiency? And so the idea here is to drill a series of pilots - and we're going to be doing that in both Hidden Bench, Pronghorn, Sanish, possibly Missouri Breaks as well - to go in and drill on higher densities, essentially doubling the density in the better reservoirs in there, to demonstrate our ability to increase that recovery efficiency, get it up from 10% or 11% up to somewhere around 20%. And what that means is breaking up more rock. And we don't believe that with the current spacing that we are on, that we are getting all of the oil that's out there. So that's really what this is all about. The amount of incremental oil that can be recovered if high density drilling proves viable is enormous. Continental Resources currently estimates total oil in place in the Bakken Petroleum System - including Deeper Three Forks - at 903 billion barrels. Obviously, the initial recoveries are always low in these large fields. Historically, that's been the case. And as you go on and technology advances along with development, that number always tend to increase. 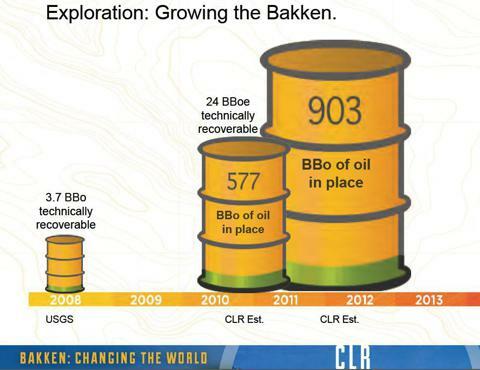 So at 5% [oil recovery rate], you're looking at 45 billion barrels. So is that within reason? I think it is. The 45 billion barrel estimate is almost a double from the 24 billion barrel figure established by Continental three years ago. In terms of oil reserves, the new estimate may put North Dakota, ahead of many oil-rich countries. Continental is again at the forefront of the effort, having announced four comprehensive pilot density projects to test 320-acre and 160-acre spacing in the Middle Bakken and first three benches of the Three Forks. The program includes 47 gross wells. 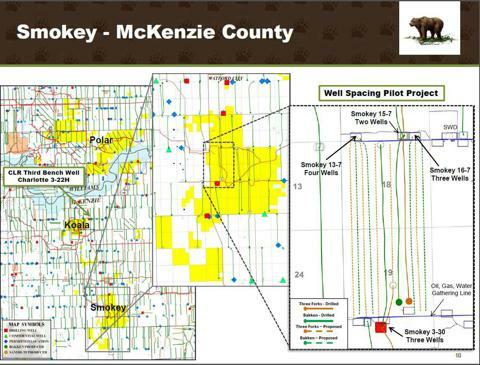 … As far as the density is concerned - obviously, we've got a lot of wells - we've got numerous wells that have been drilled in pairs of wells that are 660 feet offset: the Middle Bakken and the first bench well, and they are 660-foot offsets. And we're not seeing any influence on IPs or even EUR. So I mean, there's just a constant building of data set out here that's saying that the pattern is not causing any kind of degradation in at least initial rates. … It really is going to be about the quality of the rock in a given area and how it performs with the stimulation technologies that we're currently applying, leaving room, of course, for additional optimization, additional stimulation techniques that we might use in the future. Continental has already initiated its first 320-acre pilot density project, with three wells currently being completed and two more being drilled. 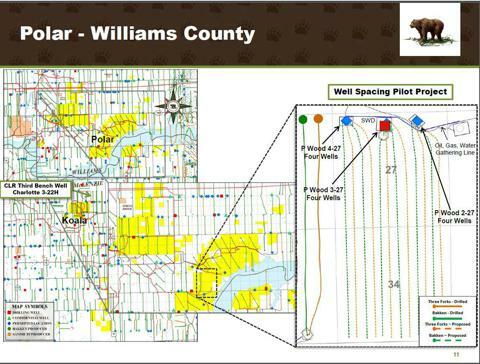 The 160-acre pilot and the next 320-acre pilot are scheduled to spud by mid-2013, with the third 320-acre pilot planned to spud in the third quarter of 2013. Continental's evaluation program is remarkably comprehensive and integrates four intervals, the Middle Bakken, TF1, TF2 and TF3. 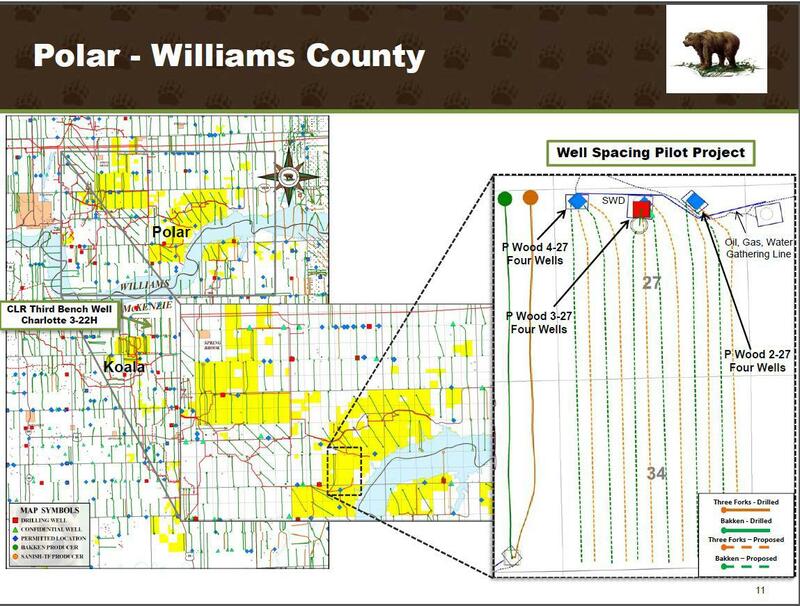 In each pilot, the wells are arrayed to help determine the optimum well spacing and pattern to maximize the ultimate recovery of oil from the multiple Bakken and Three Forks reservoirs. 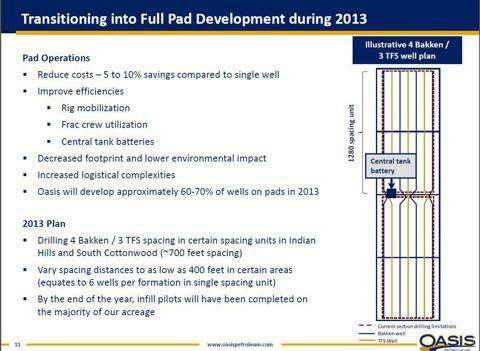 According to Continental's press release, these "aggressive pilot projects over a wide area in the field" will be drilled and completed over the next 18 months, with production coming on line starting in late 2013. 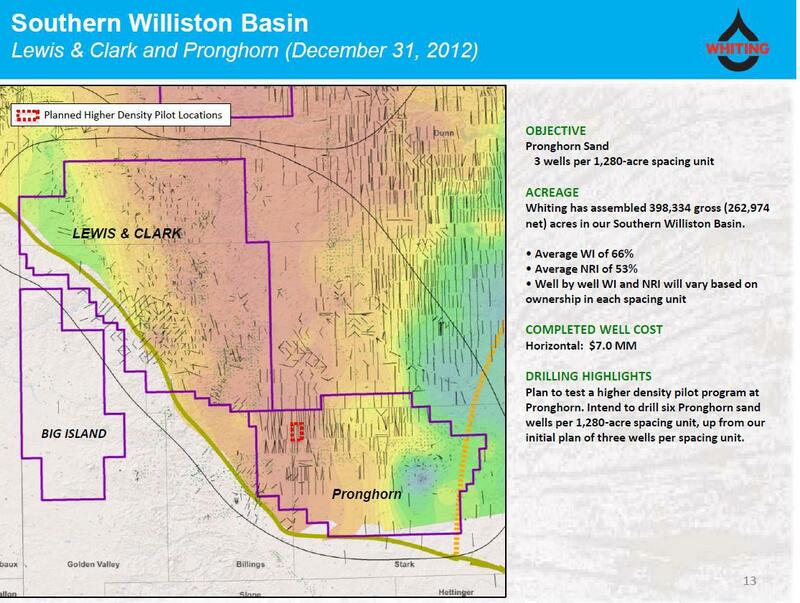 All wells in the program should be producing in the first quarter of 2014. These exploration and appraisal programs should help determine the ultimate recovery of the field and drive valuations higher by accelerated de-risking and down-spacing. Kodiak is moving ahead with two high-density pilot programs this year, one in its Smokey operating area and the other in its Polar operating area. The two pilots with include up to 24 wells and are an important undertaking for Kodiak, with one third of the company's 2013 budget committed to the program. Both projects are well underway. In the Polar project, Kodiak is currently running three rigs. In the Smokey area, one rig will be finishing three more wells. 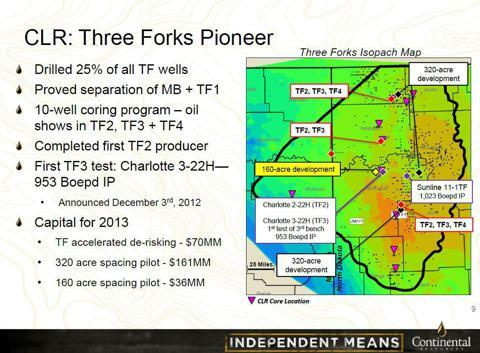 In both pilot programs, Kodiak intends to drill six wells in the Middle Bakken and six wells in the Three Forks. In the Middle Bakken, individual wells will be drilled approximately 800 to 850 feet apart (taking into effect lease line setbacks and the size of the drilling unit). The Three Forks wells will be located in the first and second benches (what Kodiak calls the Upper Three Forks and Middle Three Forks intervals). Kodiak has set out to locate the wells in the Three Forks based upon an alternating sequence between the first and second benches to reduce the impact of possible communication between the two intervals and make sure that the frac procedure "is opening this entire interval up." The final location of all the Three Forks wells is yet to be confirmed: Kodiak has just completed coring operations on one of the wells in the Polar project area and will be evaluating the core to determine the optimal location of well bores in the Three Forks. ... We have drilled wells this closely spaced several times. While we see pressure communication occasionally during fracture stimulation procedures, we have not observed any sustained interference between wells during production. We believe it is important to see what the impact of spacing is on a larger group of wells within the drilling unit. During the second half of December 2012, we observed evidence of communication between wells during fracture stimulation procedures. As a result of that we decided to revise our completion procedures. Based upon our new observations, we decided to shut in all producing wells within the immediate vicinity of completion operation of new wells. With this approach we are seeing a positive response from the shut in wells once they are returned to production, which leads us to believe that we are initiating new fractures into the old well bores and finding new reserves. What you do see, you get different fractures. Some of the individual fractures go a long ways and fluid will go a long ways, but we're not packing proppant out there. Our proppant packs within a few hundred feet of the well bore we believe. So occasionally you see the fluid travel over a distance. We have seen wells that were producing actually communicating with a fracked well nearby and so we've been very careful to shut all of our producing wells in when we frac. But we are not seeing communication or we're not seeing interference during production. It changes once you take that, you release that pressure, flow the wells back, the cracks that you open up over a long distance seem to heal up and where we have fracked wells near producing wells, the producing wells tend to get better. …We believe that as we frac wells more closely together we're going to create more fractures and actually enhance the production. That's all just the difference between your hydraulic link and your prop link and like Jim said, we've seen hydraulic links over a couple of thousand feet into existing well bores. But to close, usually our performance is a little better on the existing wells. …We have seen some positive responses when we've brought some wells back on production. And so we're not sure it's going to be a negative impact whatsoever at this part. The "few hundred feet" comment from Kodiak for the proppant packing range is the critical data point that may ultimately define the density of the development. The discussion indicates that we may see "array fracking" as the next phase in fracking technology and management technology evolution - the simultaneous optimization of multiple lateral positions throughout a thick interval to create the most effective fracture system measured against cost. Kodiak expects to commence completion operations in its Polar area project in Williams County around midyear. The company is planning a micro-seismic project to gather additional information during the completion process. 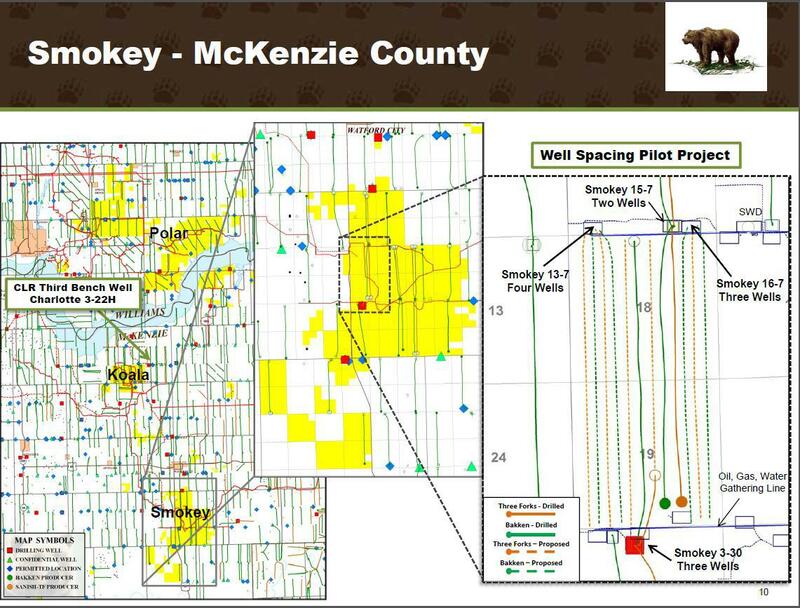 Completion operations in the Smokey area in McKenzie County will be done throughout the year with full development completed after the Polar project. Oil, gas and salt water disposal infrastructure has been completed in each of the pilot areas with the expectation of them being fully operational prior to completion operations. Kodiak expects that they will not have immediate information about the pilot programs available publicly due to the length of time it will take to complete the operations and the time necessary to evaluate the production. However, the company hopes to gain some useful information towards year end. 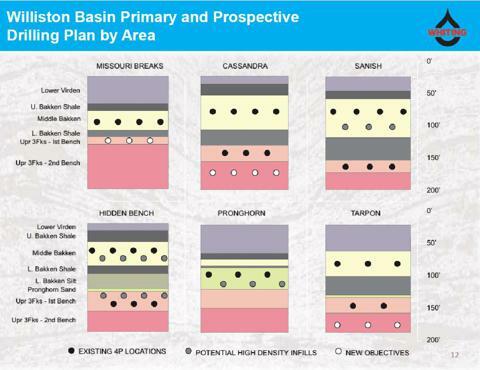 Whiting Petroleum is planning at least six, possibly seven, downspacing pilots, in its key operating areas to be initiated over the next several months: one in Hidden Bench, one in Pronghorn, and four in Sanish Field. Several pilots are aggressively-spaced (as low as 160 acres). In Sanish, Whiting plans four high density pilots to be initiated in the first half of 2013. If successful, the downspacing may add up to three additional Middle Bakken wells per 1,280-acre spacing unit. 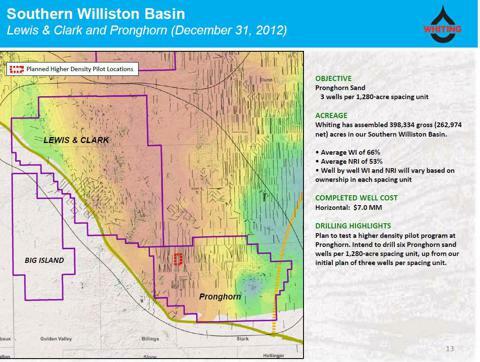 In Pronghorn, the company plans to test a six-well high-density pilot targeting Pronghorn Sand on a 1,280-acre spacing unit, up from the initial plan of three wells per spacing unit. 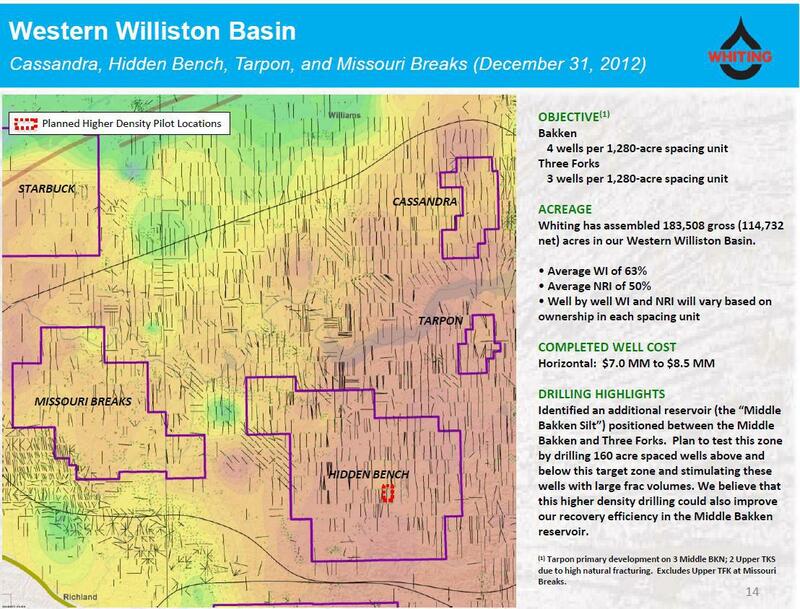 In Hidden Bench, where Whiting has recently identified an additional productive oil-bearing reservoir (the "Middle Bakken Silt") positioned between the Middle Bakken and Three Forks, the company plans to test this zone by drilling 160-acre spaced wells above and below this target zone and stimulating these wells with large frac volumes. 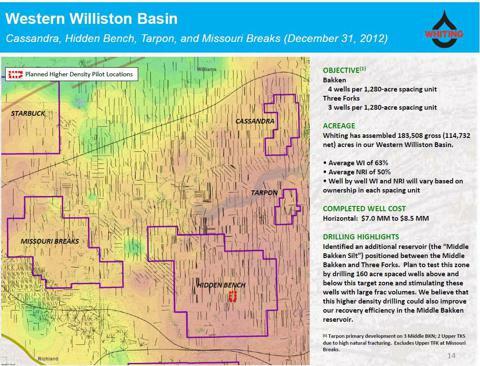 Whiting believes that this higher density drilling could also improve recovery efficiency in the Middle Bakken reservoir. If those are successful, as we expect them to be, we'll be able to capitalize on that, go into full development mode on this higher density spacing towards the latter part of the year and certainly into 2014…And then it's going to take a little bit of planning to go ahead and re-space a lot of this. We're actually looking at the possibility of re-spacing Sanish right now. There's no reason not to do that. And so at any rate, we'll try to make sure that all of that happens as efficiently as possible. But I think as the terms of actually getting in the development mode, we're going to be talking about the latter part of this year or early next year before we can actually drill on that higher density. 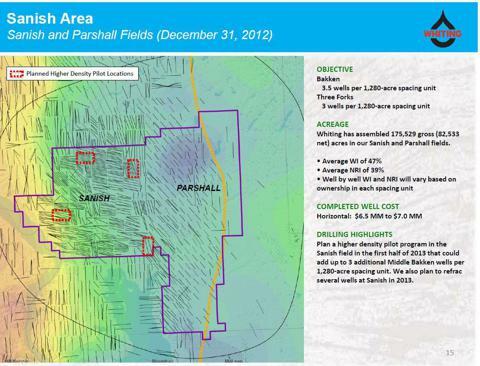 EOG Resources has also announced that it is actively testing 160-acre spacing both in the Parshall and Antelope Extension. 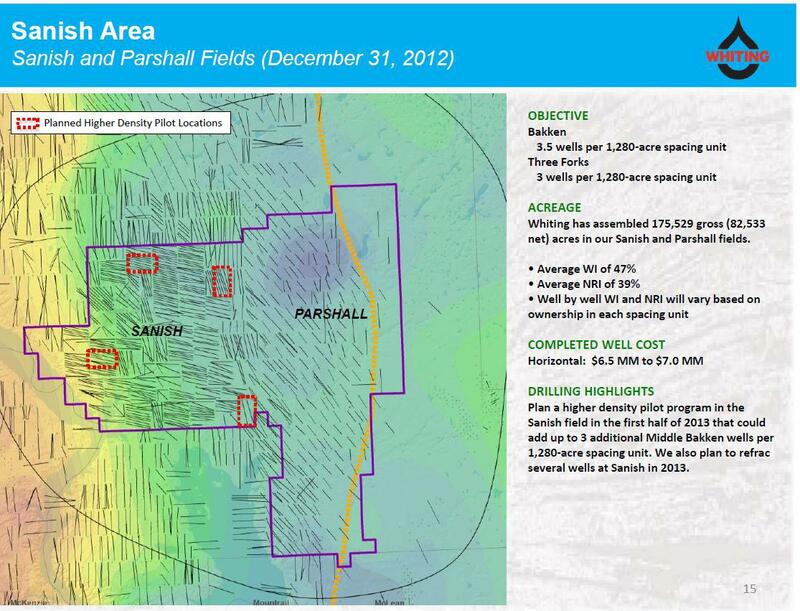 It is important to note that EOG has been drilling the Parshall predominantly on a single well per unit pattern. 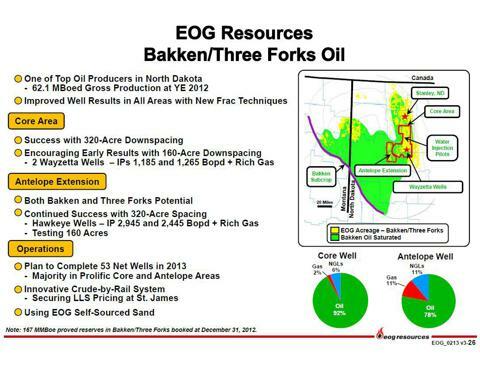 As a result, EOG is in a great position to optimize the development of what is arguably the most productive and still sparsely developed part of the play using advanced approaches. 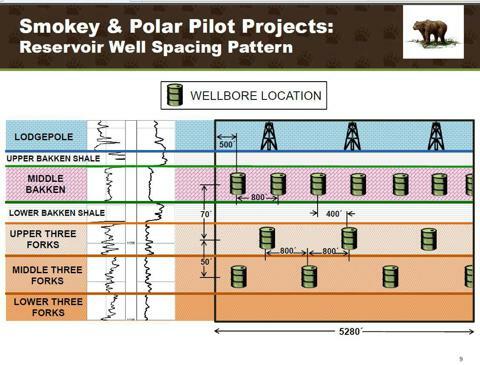 Oasis Petroleum has also announced that this year it will test shorter spacing distances between wellbores (6 wells per formation in single drilling unit) but in certain tests may place wellbores as closely as 400 feet from each other. Oasis plans to complete infill pilots on the majority of its acreage this year. The majors, Exxon Mobil (NYSE:XOM) and Statoil (STO), and super-independents, ConocoPhillips (NYSE:COP), Marathon Oil (NYSE:MRO) and Hess Corporation (NYSE:HES), as well as privately held operators - the companies that account for a large portion of drilling activity in the Bakken - rarely share sufficient details of their operation in the play. However there are multiple indications that the downspacing evaluation and deeper Three Forks testing by this group of companies is also ongoing. Based on the wave of testing activity across the board, the shift towards high density drilling patterns in the Bakken, at least in its most prolific areas, may occur rapidly. The fact that many of the announced high density pilots are configured on aggressively downspaced well patterns indicates that the 160-acre spacing is already used by several operators as the "null hypothesis" for full development mode, at least for those areas where well productivity is high. Clearly, the results of the pilot programs will not be known perhaps for another few years. If positive, Continental's 45 billion barrel estimate for total recoverable reserves in the play may prove conservative. Under an optimistic scenario, the downspacing, in combination with the lower Three Forks development, may have a dramatic impact on potential resources that various companies would be able to count on. If early indications from the pilot drilling this year prove positive, investors would obtain a reason to start pricing some of this upside in the stocks already this year. 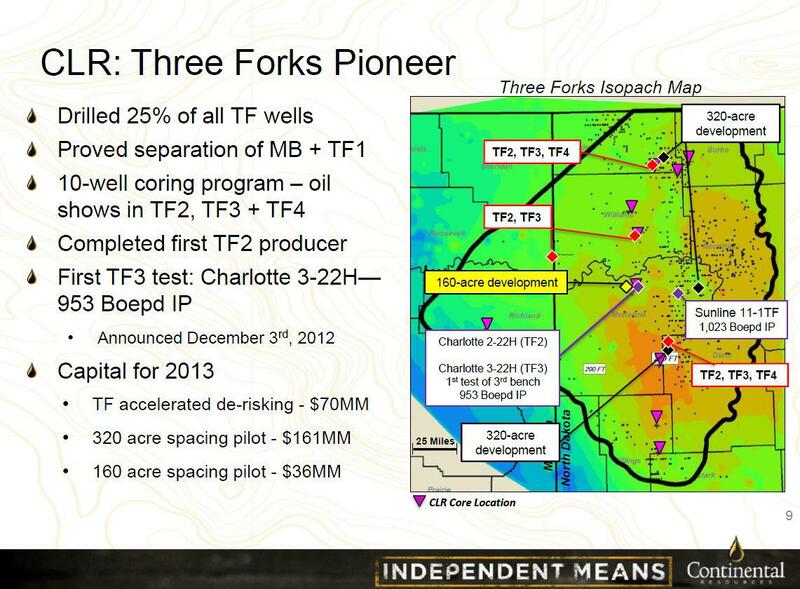 Continental Resources presentation from last fall shows that the company's resource potential could triple if well density went from 320 acres to 160 acres and included the deeper intervals. The economics of the downspacing is a somewhat different issue. 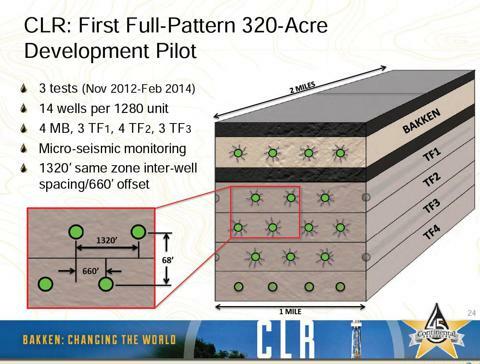 It is hard to imagine that aggressive well patterns will have no material impact on the projected EURs. With many "bread & butter" wells in the Bakken having ~300-400 MBoe EURs and as a result underwhelming economics, the downspacing may not work everywhere. In the more prolific parts of the play however, the appeal of the concept is tremendous. The downspacing pilots should provide operators in the Bakken with rich new data. Once the early phase work is complete and operators turn to designing drilling plans for full field development, they will look at the best areas and calculate how to optimize and maximize value of the resource in the ground. With a better understanding of what the sweet spots are and what deliverability and operational efficiencies can be gained from these large-scale high density programs, the array designs and completion technology will be modified to ultimately produce better economic returns. A logical step in the evolution of this truly bountiful and still very young play that is quickly approaching the age of maturity. The downspacing trend discussed above should provide a meaningful contribution to the long list of operating catalysts that 2013 will bring for the Bakken. The impact on Bakken-focused stocks should be universal (although likely gradual). Companies with highest quality acreage positions should benefit most.